Jon is my sweetie's oldest son. 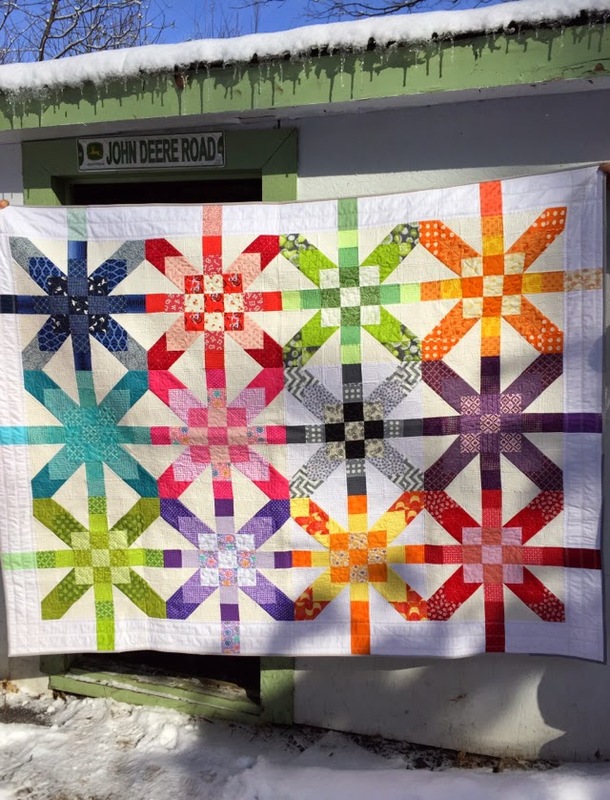 I have made a quilt for every single one of our kids - some of our children even got multiple quilts, but Jon had yet to receive one. And he reminded me every chance he got! So a few weeks ago, I finally got started on a quilt for Jon. This "child" is a 6'2", 240 lbs 25 year-old man - so the quilt needed to be pretty masculine. I knew a modern design would be perfect for him - clean, simple and definitely no frills or floral patterns! I chose a pattern I found in an old issue of Quilter's World called Zen Garden. I used 3 different shades of Kona greys and some grey, green and blue prints for just a shot of colour. For the binding, I went with a white print on black. For the quilting, I decided to go super simple and stitched straight vertical lines with my walking foot. The finished size is about 62' x 75" - perfect for a quick snooze on the couch. I'm happy to report that he is very pleased with his quilt. So much so that I only had time to take one picture before he grabbed it and took it home! I will be linking up at Crazy Mom Quilts for Finish It Up Friday and at TGIFF. 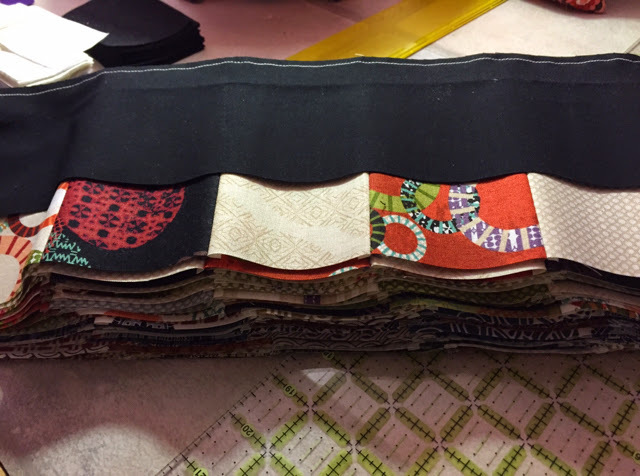 A few weeks ago, a fellow MMQG who also happens to design fabric for Michael Miller, asked me if I’d be interested in making something with her newest fabric collection and blog about it. I just love Tamara’s designs so of course, I immediately said YES! And Festive Forest doesn’t disappoint. The prints are adorable; the colours are bright and happy. I wanted a pattern that would let those beautiful prints shine so I picked Patio from The Happy Zombie. 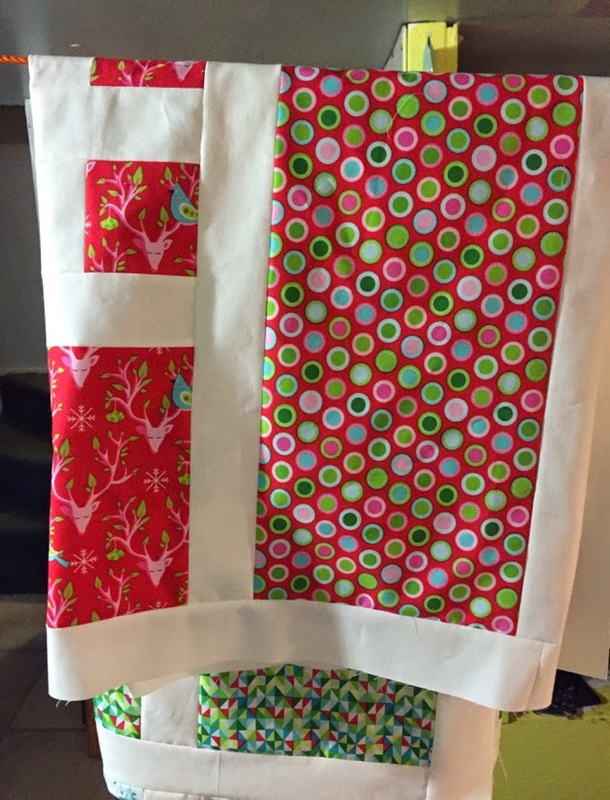 I used a white solid so the fabric would pop and used 12 fat quarters for the blocks. I quilted it with big flowers in a really subtle pink thread. Now that it’s been washed and dried, the texture is amazing. The finished size is 62” x 82”. Festive Forest is shipping to shops right now. If you’re looking for a holiday collection that doesn’t scream Christmas, this is it! I mean seriously – how adorable are these little foxes with the sweaters? Thank you so much for allowing me to play with your fabric Tamara! 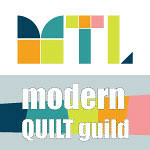 Linking up at Crazy Mom Quilts for Finish It Up Friday and at TGIFF. This is also Finish #2 on my Q2 2015 FAL list. The first quarter of 2015 was very productive for me. I completed 4 of my 5 goals and even managed to finish some pillows which weren’t on my Q1 list. For Q2, I’ve got a lot of big goals and will be linking this post up at Adrianne’s for FAL. 1. Grey Crochet Blanket – This one was on my Q1 list and I didn’t quite manage to finish it up, so it’s going on the list again. With the NHL playoffs coming up, there will be lots of TV time during which I can work on this blanket. This should get done before June 30. 2. 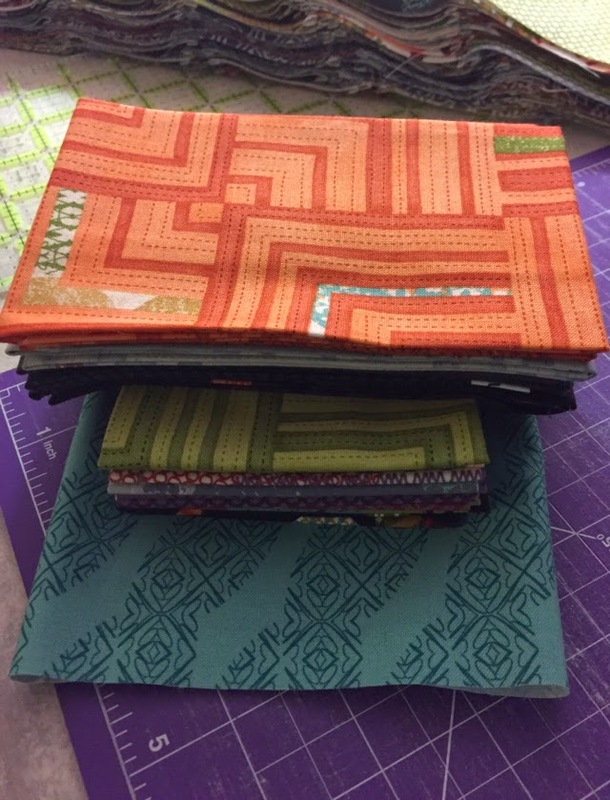 Secret quilt for Tamara – A fellow MMQG member who designs fabric for Michael Miller asked me if I’d be willing to make something with her new fabric collection coming out this month. I’ve got the top all done and I started the quilting. I'm pretty confident I'll be able to complete this within the next week or so. 4. Bed quilt for Max – My son also asked for a new quilt for his bed. I made him a quilt a few years ago, but it’s too small for his bed and he really, really wants a quilt for his bedroom. I started piecing the top already so finishing this up before June 30 should not be a problem. 5. 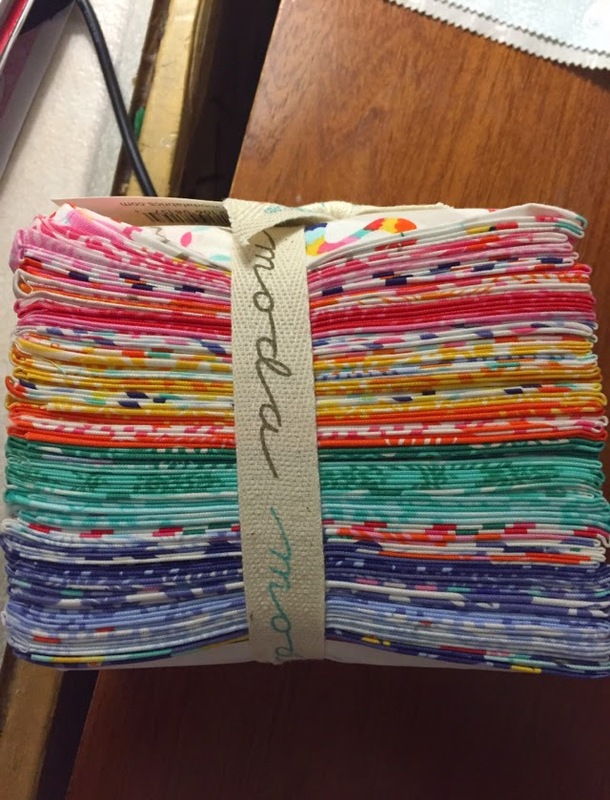 Bed quilt for me – You might remember I made a Swoon quilt for my bed last year. Turns out 82” square isn’t big enough for my Queen size bed because the quilt doesn’t hang down low enough (I’ve got one of those super thick mattresses). So the Swoon quilt is going on our bed at the Island House this summer and now I have to make a King size quilt for our bed in the city. 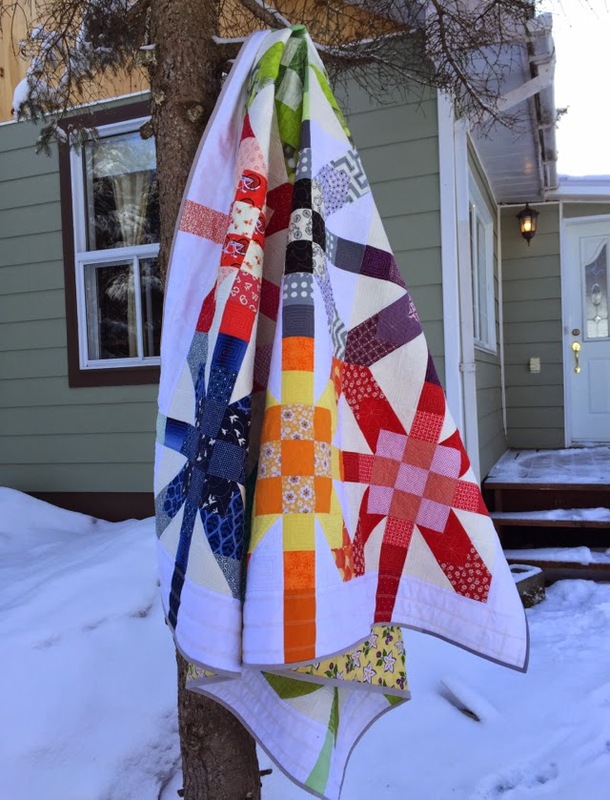 I will be using this fabulous bundle for this quilt and will most likely use the QAYG method to quilt it and finish it. 6. 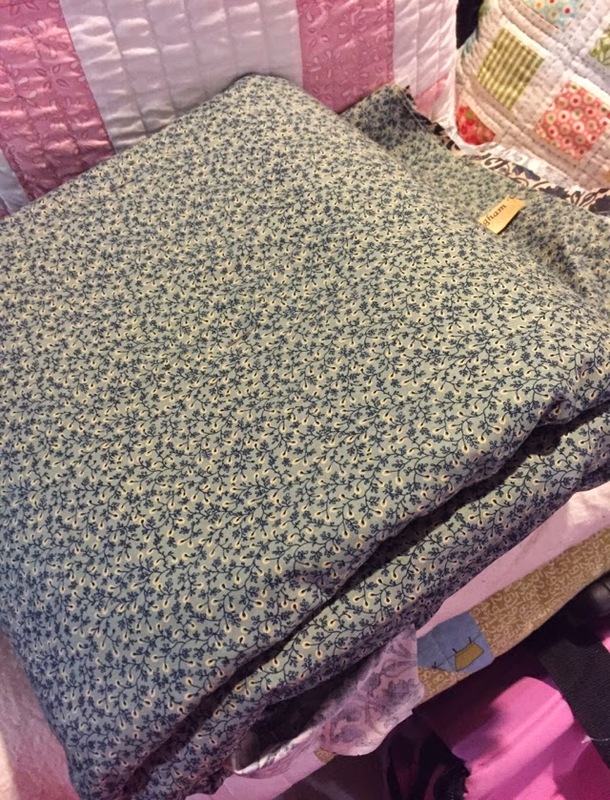 Pillows for my bed – I want to make 3 pillows that will match the king size bed quilt. Hoping I can use the scraps from the quilt for these. I already have the inserts, but I need to buy zippers for these. 8. Wall Quilt for the new dining room – There is a major reorganization and re-decorating effort going on at home at the moment. We moved our youngest to the basement bedroom and decided to turn our old bedroom into a formal dining room. I have a bundle of Juggling Summer by Zen Chic that I want to turn into a wall quilt for this dining room. 9. 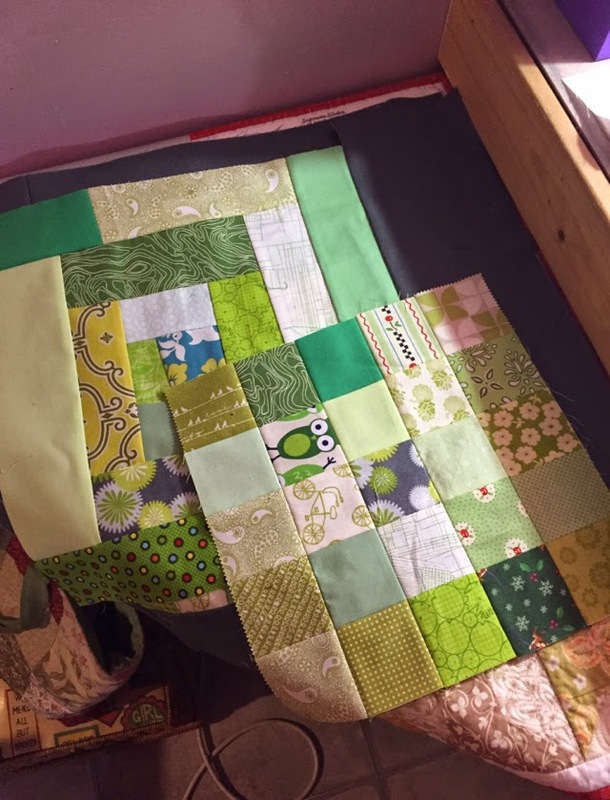 Green Scrappy Quilt – I have to get my scraps under control. I have bins and bins full of them. I started making scrappy, wonky log cabin blocks with my green scraps and I hope to have a finished lap quilt within the next couple of months. That should keep me busy for the next 3 months! I finished it! 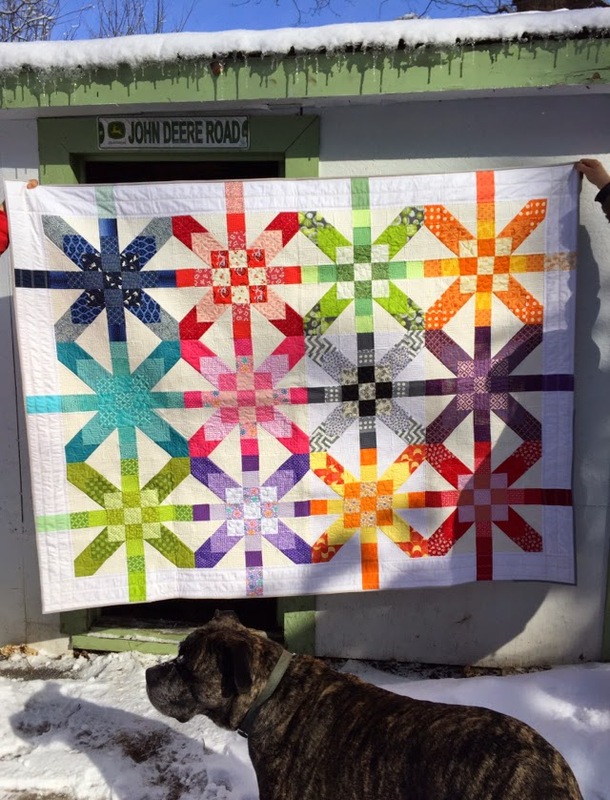 I started this quilt back in May 2014 as part of the SuperNova Friendship Swap and, at last, I can share it with you and call it finished. You can see some of the progress posts and pictures here and here. 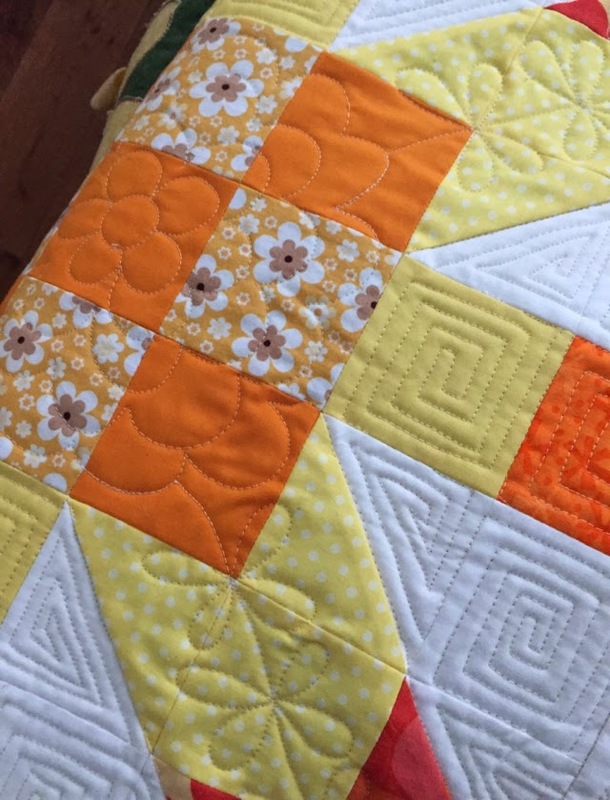 Many different fabric scraps went into this quilt and I just love those huge blocks. The background is Kona White and Kona Snow (not on purpose, but hey, it happens to the best of us apparently). 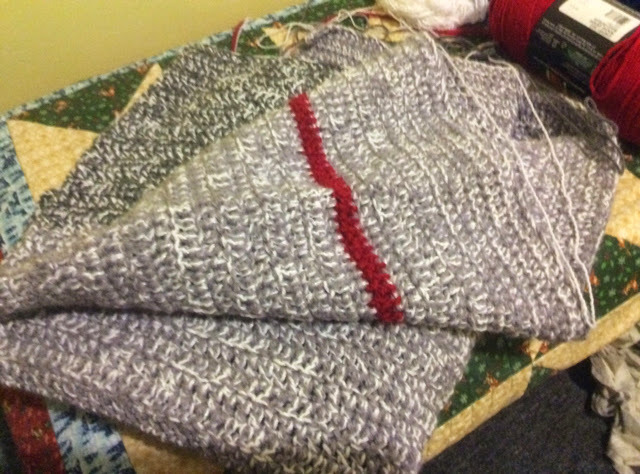 The binding is two shades of Kona greys (not 100% sure which ones unfortunately). For the quilting, I went with three different designs. And square spirals in the background. This has now become my favourite filler. I just love thetexture this design gives the quilt. And just for fun, here is a picture of SuperNova with Bronx coming over for a quick sniff. This is another finish on my Q1 FAL list. 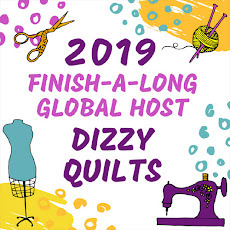 I will be linking up at Crazy Mom Quilts for Finish It Up Friday and to TGIFF hosted by Quokka Quilts this week. Check out the link ups for some amazing inspiration! And for those of you who celebrate, Happy Easter!